In which I complete my first adult cardigan, and my second major adult knitting project. 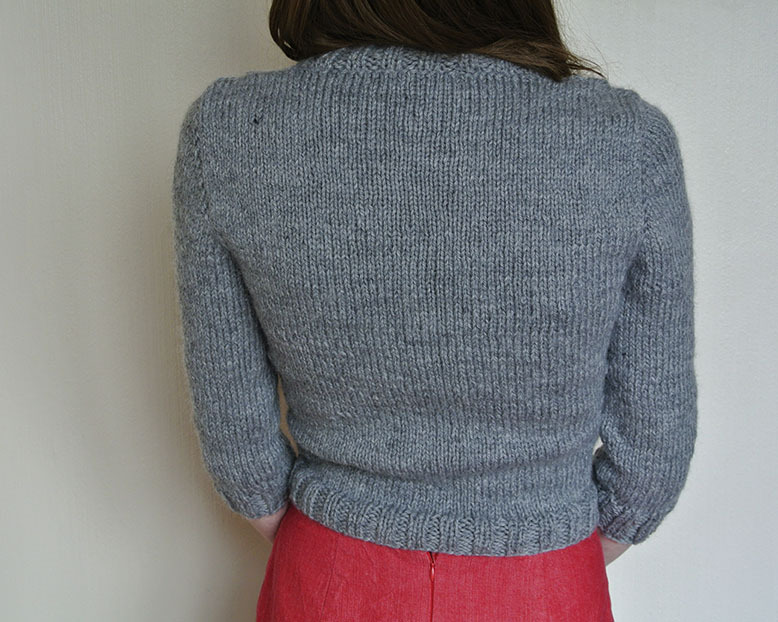 Granted, it is cropped with three-quarter sleeves, but it’s a cardigan no less. The pattern is Andi Satterlund’s Marion, and like Chuck, is an easy to understand pattern, and a relatively quick item to knit. I followed the pattern for size XS, and only made the change of omitting the cables on the sleeve ribbing. It was a little too twee for my tastes. The wool is Drops Alaska wool in a slightly heathered grey. I bought it to knit my first jumper, but wasn’t happy with the fit, so I frogged it. A hard lesson to learn, but it’s nice to use the salvaged wool nonetheless. In comparison to the yarn I used for my Chuck (Drops Big Merino), this yarn seems to hold it’s shape better. As a relatively new knitter, I’ve got no idea why, but my instincts tell me it’s to do with blocking. Big Merino is nice and squishy, whereas this Alaska wool felt quite scratchy and hard when I first used it. I wet blocked Chuck, as in soaked the whole thing and laid it out on a towel to dry. It seemed to stretch quite a lot, and despite washing a few times, still feels a bit off fit-wise (although this could also be the size I knitted it in). The weight of the wet wool really pulled the shape. For this cardigan, I pinned out the shape according to the schematic and sprayed it with water, fluffing up the cables as I went. The result seems a lot better. The little black dots you can see are just black bits in the wool. There aren’t many of them, but I love a little random imperfection like that. I’m pretty happy with this, although a cropped style is not my usual choice for knitwear. It seems best to wear it with high waisted skirts, although I’m sure as time goes on I will work it out. You may have noticed the buttons are a bit off. I’m not sure exactly what I did wrong with the buttonholes (I did actually go back and re-knit them a couple of times), but whatever I did, it was wrong and I’ve got some odd half holes that buttons can be out through, but you have to feel around for them and do a lot of guesswork. I’m not entirely sure what the solution is, but I’d love to hear if anyone has suggestions…. I still have a hell of a lot to learn about knitting, and a lot more speeding up to do. I practiced quite a bit of continental style knitting on this, and I ventured into magic loop territory. I’ve ordered more wool for my next project (Drops again – I’m a student with a budget, what can I say), this time some 4-ply which is exciting. Five times a week may seem like a cop out, but last year was a struggle. I ended up in the same outfits, disliking them immensely and threw out a lot of stuff afterwards. Which was good, don’t get me wrong I love a good clear-out, but it’s not as if I have suddenly acquired a new fully stocked wardrobe of handmade clothes. I am hoping that this year’s MMM will inspire me to finish up a couple of loitering projects, and also make up a few more. I’ve just gotten into the Moss, and today purchased a Nettie, although knowing my ability to procrastinate, maybe I shouldn’t have mentioned anything. We shall see. And finally, More stuff in my Etsy shop! (Tenuous M, I know) I’ve put up some vintage buttons and will be putting in more as time goes on, as well as more patterns and some fabric. I’m in desperate need of a clear-out, so I must make efforts to follow through. Follow the link on the right hand side!